I'm a thug in my late 20s (does that mean I'm past my prime?). I have my B.A. in Human Development, though I currently stay home with our thug baby. My thuggish ruggish husband is an instructor at a power plant, though we usually keep that to ourselves so as not to risk our street cred. But we weren't always thugs...no...but one day we decided to go to the dark side. A pittie name Paisley dragged us over and so our thug life began. We also recently began fostering through A Rotta Love Plus here in MN. Our current thug-dog-in-residence is Mischief, a little bull terrier pup. He has settled into the thug life quite nicely, enjoying daily play sessions--er, or do I mean fights? !--with Paisley, usually followed by a nice nap on one of the many dog beds strewn around the house. We do feed them daily, though we've heard withholding can toughen them up. Outside time is critical to the thug life--I mean people have to see the tough dogs for it to count right?! Other interesting facets of our oh-so-thug life: we listen to NPR more than we watch TV, we bike as a family (sans dogs for now, though we're trying to figure out to include them), we cloth diaper and strive to use fewer disposable products over all, we buy organic when we can and when it makes sense, and are generally just trying to live a more natural, meaningful life. And all with 2 dangerous dogs in the house...just how do we do it?! Oh and don't forget the cats--adopted cats are another critical part of our thug life, right?! If you aren't on our mailing list - sign up HERE for the very-occasional update and alert. Thank you! Life can get tedious at the shelter. Once our dogs learn their basic obedience, it's a challenge to give them enough work to ward off kennel stress while they wait for that adoption that always seems to take longer than we expect. To help keep our dogs sane & happy, our trainer Sara has become a master of finding new ways to engage them. This is Newman - one of our brainiest little guys - learning a new game. If dogs can be nerds, he fits that description. He's a real 'thinker' - always trying to figure out how the world works. He's so cerebral that he's even good with cats. Okay adopter -- come meet this boy before he figures out how to pick the locks and hot wire the Animal Control truck! Thanks to a blog reader (hat tips, anon) for sending a link this morning about a raid in Alabama. The news is sad, the story is perennial, but the compassion shown by the authorities is encouraging, and we have to hope, a sign of a new trend in animal law investigations. 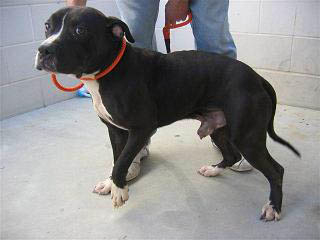 It was reported that Montgomery Humane Society will be evaluating the animals and making them available for adoption. That news seems a little premature since of course the dog owners have a right to due process, however interested readers might want to send donations to MHS for the extra burden of housing and placing the dogs, along with a hardy 'thank you' for taking them in. While the news is calling this a dogfighting operation, we have to point out that old scars and chaining should never be misconstrued as fight evidence. The authorities will have to produce more substantial evidence in order to justify felony dog fighting charges (if that's what they're going for). In the meantime, it appears that the lack of water and food gave them enough cause to remove the animals. Kudos to them. Lookit this girlie. She gifted us with a happy ending today that, at first appearances, wasn't supposed to happen. If you remember Sophie, she was the severely neglected dog that was slated for a week's compassion hold before we put her to sleep - Eep. We do a certain number of compassion holds for dogs that are too damaged or sick or troubled for adoption, but who otherwise deserve a a little kindness before they go. But thankfully, Sophie was SO messed up that her optimism just seemed to shine out ten times brighter than other dogs, so she found her way like so many other dogs can't. This is the first round of people who saved Sophie - Martha left, and Megan of the Oakland Animal Services. In this age of fad breed overpopulation, they say more good-byes than any human should have to say, so Sophie's return from the dead means a lot. The next in line is BR foster mom Stephanie - shown in the video - who provided a respite when we thought she was going to die with us (Stephanie knew better from Hour One). 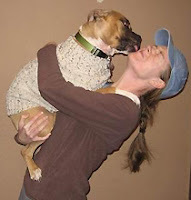 And next is Teresa and Ted and their pit bull Bubba, who shouted 'Mine Mine!' when they first spotted Sophie here on this blog. Twelve year old Sophie has a happy home with these folks and they consider themselves lucky to have her in their lives. Bless you, people. We need more of you on this planet, pronto. A few people have commented on Harley from yesterday's blog. Yep, the bully gods sure had a sweet tooth for handsome dogs when they brewed up this likable fellow. Here's a little video of him being predictably adorkable. It's about the PEOPLE, people. Holding people accountable for their actions is just common sense. Here are some cases that remind us to keep blame where it belongs. 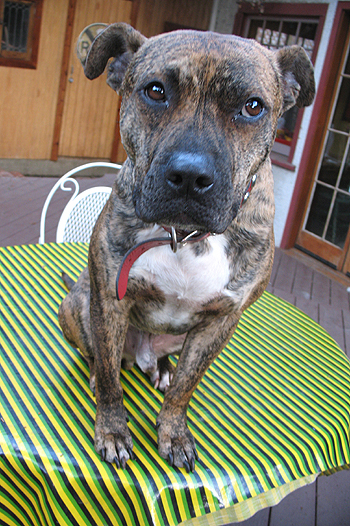 An OR man was sentenced to one year for abusing his pit bull ... A San Jose man is facing felony charges for letting his off-leash pit bull hurt another dog ... A St. Louis couple was charged with evidence tampering when they tried to blame a tiger mauling on a pit bull....Oy vey. And - finally! - Marjorie Knoller was sentenced to 15 years for the mauling death of Diane Whipple. That took far too long. Thumbs up to the prosecutors for getting that conviction. We presented at an American Bar Association event in Chicago this past Friday. One of these days, I might actually be able to stand up and address an audience about the Vick dogs without choking back tears - but not yet. Wimpy-Me. It was fascinating to hear little known case details from the attorneys that worked on these and other similar cases. 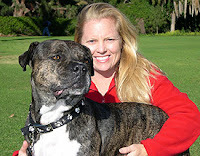 ASPCA forensics expert Dr. Melinda Merck was recognized about a dozen times as being one of the main reasons Vick and his boys folded - It's nearly impossible to fight charges with so much physical evidence. Thanks again, doc. A highlight of the event was an award presented by Special Master Guardian Rebecca Huss. 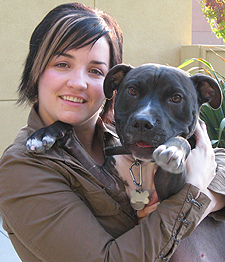 It was the first annual 2008 Rose Memorial Award for Compassion in Action and it went to BR's own Nicole Rattay for putting her life on hold in order to bring comfort & compassion to the Vick dogs that waited six additional long weeks in confinement. Kennel stress was taking a heavy toll on the dogs, but Nicole's work gave the dogs a head start on their healing. Congratulations Nicole, and thank you again. "Those who say it cannot be done should not interrupt the person doing it." Too many wonderful puppies and dogs are flowing into Oakland Animal Services this season (and, everywhere, we imagine). 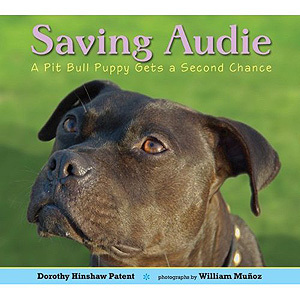 It pains us to see pit bulls especially falling out of hard-luck homes and into overcrowded shelters. If you've considered adopting anytime soon, now's a good time...There's no shortage of exceptional dogs that are in danger. This is Harley. He's a puppyish dog-social dork, and - Tim's description - a Wiggle Master. Wanna fall in love? Let us help. If you’ve been following the Michael Vick story, you know BAD RAP Pit bull, Ted, his foster family Christine and Rob, and their young son Sam. Early on, Sam called this big white dog Teddles and Ted Baby. The names stuck. I have the pleasure of seeing and working with Ted in my weekly Canine Good Citizen (CGC) class. He’s in his new home now, adoption pending, with his person Cindy. Ted just missed passing his CGC test last month because he’s afraid of trains and loud noises. As luck would have it, this test site was a stones throw from Amtrak and freight train tracks. 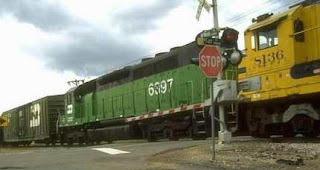 In the middle of his CGC test, a train roared by and Ted, completely distracted, couldn’t recover fast enough to get back to work. Cindy was understandably disappointed. In the weeks since though, Cindy has started to wait in happy anticipation for the train. As soon as that train blasts its obnoxious horn, Cindy whips out a favorite tug toy and Ted gets to play "watch me” and tug games. Just the other day as the train screamed by, Cindy and Ted tugged together. Ted had forgetten all about that train while he happily focused on Cindy and his games. I felt a big smile spread across my face. You’ve come a long way (Ted) Baby! This is Alf. He's one of the Vick dogs. He endeared himself to us back in Virginia with his wonky ears, stubby legs and wild goo-goo eyes. Alf has been staying rather incognito while his rescuers from Richmond Animal League focused on re-introducing him to the big bad world. He's been playing with other dogs, learning to stay steady around loud noises and he even earned his Canine Good Citizen award. Well done, Team Alf. We were ever so happy to learn that Alf's foster mom, Molly Gibb, was finally feeling ready to introduce him to the media. A somewhat scary prospect, considering the pair lives in Oklahoma where breed prejudice hit a feverish pitch this summer. But Molly is brave, and her move-forward attitude is rubbing off on Alf. All hail the funny faced little dog and his diehard support system. You so rock. We took the plunge at Oakland Animal Services this weekend and set up a little homestead for the Ambassadog project. 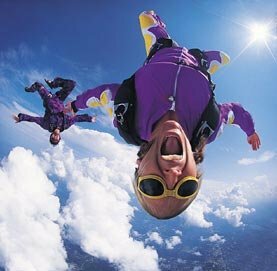 As luck would have it, our new trailer is a reincarnated skydiving school from Sonoma, complete with a parachute storage rack. Cowabunga! We don't expect to need parachutes anytime soon, but we love knowing that this sweet piece of portable real estate comes with a legacy of big and happy adventures. It's a leetle bit blue right now (rare blue?) but a couple of work parties will spiff it up and help bring it down to a respectable institution beige so we don't frighten the neighbors too much. We look forward to having a home base at OAS and a space to give the dogs some TLC away from the shelter's noise and daily hustle. Big thanks to Dee for gifting the trailer to BR and to PoPo's Transport for donating new tires & labor so it could make it's way on down to Oakland. You were our angels this weekend and we're so grateful! Team Pibble 2008: Woot! Woot! Woof! Team Pibble here. Woohoo! We finished the Folsom International Triathlon, our fundraiser for the Ambassadog Project over at Oakland Animal Services. Your contributions are going to make such a difference in the daily quality of life for these dogs. We cannot thank so many of you enough for your generous contributions! And a screamy, extra-affectionate thanks to the pittie in a tutu Miss Clover and her family for coming out to win fans on the sidelines and to cheer us through the race. You made it SO fun!! Shelter ramblings ... Too many bouncy dogs in one room makes for a busy two days of musical chairs: Do you like your neighbor now? No? - How 'bout now? .... Ants in the treat dispenser; Damn! ... Trail of blood all down the hallway leads to Ward F. Do I dare look inside? .... Pretty red-brindle girl flinches during ball toss, then belly crawls meekly, asking for comfort. Scribble YES on her paperwork to keep her safe ... Ants in the peanut butter now? Crap. .... Piglet decides playing with Jelly Roll Jones is fine. Good news. They'll sleep well tonight.... Why is Marley back? (The home skipped the part of the directions where dog-intros should go slooow & easy, not fast & crazy. Oops.) ... Scary dog slamming at the kennel door to get to me. Why is he still here? (Oh. His owner is fighting to get him back. Good grief.) ... The nearly-naked rooster flirts shamelessly with the hen. Hasn't he looked in the mirror lately? ... Long legged husky bows and smiles. Let's take a break and give him some time outside. He dances like Fred Astaire. Who lost this wonderful dog? ... Two females surrendered with a "Please dispose of this dog" signature from their owner. One will move to adoption; the other will be euthanized tomorrow...Piglet hides her treats under her kuranda bed ... Newman wags 'Thank you' for his kong ... The laundry is totally done. Amazing ... A terrier mix barks furiously through the fence ... Checking the locks, whispering good night to Ward T, thinking about dinner ... It sure feels like fall this evening. Interested in doing shelter work? Consider volunteering with us to help the dogs. It's an amazing experience and will be one of the hardest jobs you'll ever love. Where the Party is this weekend! We hear tell that some very famous BR dogs are going to be out and about at two separate events this weekend in the bay area. 1. Doc's Clocks in San Francisco will be holding a fundraiser this Saturday, Sept 6 from 4-8pm. One half of the bar proceeds will benefit BAD RAP. WOOF! Organizer Carey even organized a silent auction to help buy extra good stuff for BR's dogs. Thank you Carey! 2. And all weekend long, BR dogs and their advocates will be at the Bay Area Pet Fair and Adoptathon at the Marin Center in San Rafael. Please stop by and talk pit bull with the gang. California towns and ciities can enforce mandatory breed specific sterilization under SB861 but they can't label any breed as dangerous. The city of Manteca doesn't seem to understand that nuance of the state law, and is finally getting called on the discriminatory language of their new spay/neuter ordinance. San Francisco stops just short of calling pit bulls dangerous and instead, uses the term "High Risk" when it discriminates. An odd way to look at pit bulls, considering the city is posting a $15,000 reward for information leading to the arrest of the person(s) who brutally murdered a pit bull puppy named Pogo (above) after he disappeared from a SF dog park. 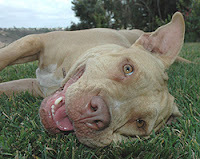 One has to wonder, does labeling a breed "high risk" or "dangerous" open individual dogs up to random acts of torture? After all, animal control agencies generally set the tone for how a community views its animals. It's not a big stretch to see that, by holding any animal in such a negative light, a city's more violent citizens might feel justified in dealing with them violently. "It's just a dangerous pit bull, after all." We hope that Pogo's killers are ratted out and brought to justice and we hope cities like SF and Manteca see the incredible harm that's created by applying such derogatory labels to its animals. A fighting machine ... a ticking time bomb ...an unnaturally large dog ... an unnaturally strong dog ...a Hurricane Gustav reject. Aww hec. She's just a nice dog that needs a home. Thanks to Animal Planet RV fame duo - Nicole & Steve - for bringing her cross country and taking such good care of her while she waits. Who gets left behind? Storm dogs at risk. We're watching the hurricane rescue efforts with nervous interest. Should we go? Stay home? In preparation for what could* be a very damaging storm, hundreds of helpers are pouring into the gulf coast to help animal victims at four rescue stations. Well done, animal orgs. But an announcement that went out on the SAWA member message board (where BR is a member) gave us whiplash: The SPCA of Texas, which has positioned itself to "serve as a hub," offered transport and logistical assistance to any adoptable shelter dog on the gulf coast. 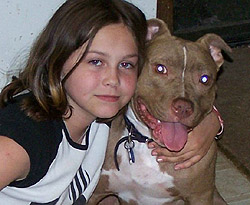 Pit bulls, however, are being excluded from these efforts. While non-pits are being welcomed into waiting shelters farther north, the pit bulls have been shuffled to other locations to wait out the storms along with the unadoptables, the strays and the very sick dogs. Sorry pit bulls. Once again, you get the back of the bus. The storms are bringing back bad memories for everyone, but this post gave us our worst memory yet. 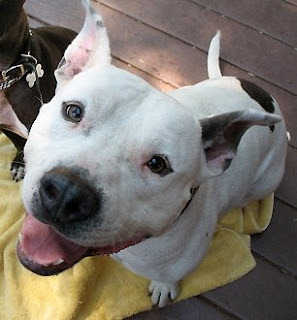 Back in 2005-06, thousands - yes, thousands - of unclaimed Katrina pit bulls were eventually destroyed in shelters that, for a variety of reasons, chose not to adopt them out. When you don't see their faces, it's easier to take. Anonymity is always easier on the heart. But so we don't forget, here are some of the dogs who might not have made it, had it not been for our supporters who made sure we could get to them. 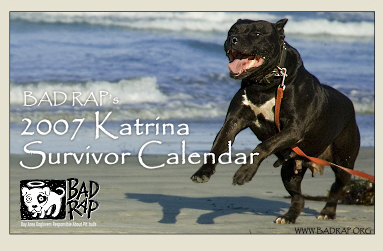 Pearl graced our Katrina survivor calendar because she represented so many of the dogs of NOLA: Overbred, scarred, heartworm positive, bad crop. She lived out the rest of her natural life as a cherished pet in San Diego. Going to the beach was one of her favorite activities. 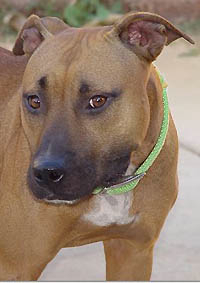 After the storms, Bailey detoured through the HSUS-sponsored Dixon Correctional Institute shelter before coming to CA. She later found a vocation as a classroom mascot for kids with autism. Monte survived the storms and went on to earn his CGC award, Therapy Dog title, ATTS title, and is now serving as a reading assistant to children in public libraries. Storm Rider Ru was not able to reunite with his displaced owner (who loved him dearly), but went on to become a therapy dog thanks to his motivated foster mom. He's now serving as a helper to autistic children in his new home in Northern CA. Handsome Jake was able to be reunited with his family in New Orleans, thanks to an identifying tattoo on his ear. Shortly after returning home, he went on to earn ribbons in ADBA show events with his child handler, Bill. This gentleman sweetheart came home with our crew and went on to live with former staffer Justin Phillips of SPCA Monterey County. 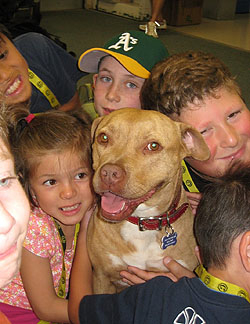 During the time his owner worked at the shelter, he served as a popular demo/education dog for the shelter's outreach programs. Found running loose in a deserted NOLA ghetto after Katrina, Hemi did a detour through HSUS DCI shelter, met BR reps in 2006, and went on to become a celebrated LawDog for the Washington State Patrol before finally passing on of natural causes in 2011. 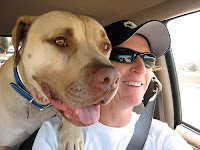 Leroy detoured through DCI too, and went on to join BR's Pit Bull Hall program. 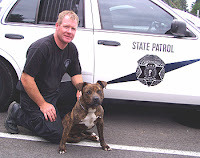 He's since earned his Canine Good Citizen certificate, several K9 Nose Work titles and serves as a demo dog for a dog training camp for kids. Martin was found alongside a dead dog in the attic of a 9th ward house. He was nearly starved himself, and rattled to the core. He now lives the good life with another dog and is earning accolades in Canine Obedience work. Sydney came from a neighborhood under water, and went on to earn her CGC and Therapy Dog certification in her new home in CA. Her adopter later became a BR volunteer and foster home for other forgotten dogs, including a drug bust survivor from the Michigan Humane Society in Detroit, MI. Darla was in very bad shape when she came back to CA. Healthy now, she serves as a playmate for one of the M. Vick dogs that shares her home. Delilah was one of the few dogs that was already spayed when we found her at the rescue station. She found a great home and is well loved. 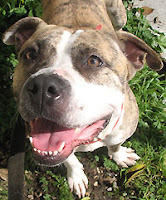 Taz became an ambassador at BR's Pit Bull Hall project and then to a home with another dog. He used to sit on tables whenever it started to rain, but has since learned to enjoy water again and is an enthusiastic swimmer. 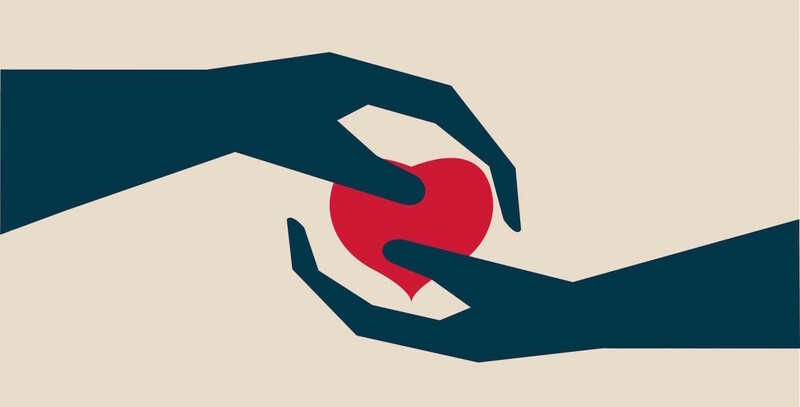 Where should you send donations? Based on their commitment to all animals, we have to recommend Best Friends for your storm donations. They're currently on the ground, moving rescue efforts forward. More importantly, we know they won't discriminate by breed.